There should be no real surprise to find out that the majority of those who identify themselves as Mormons (members of The Church of Jesus Christ of Latter-day Saints) are politically and morally conservative. After all, they are a religion that teaches things like not to drink coffee or tea, not to smoke, not to date until you are at least the age of 16, that every life counts and that families can be together forever. The recent Pew Research Center Forum on Religion & Public Life, ‘Mormons in America’ survey results were recently released, and the Deseret News has put together a five part series looking at different aspects of this research. In this their fourth piece called, “Mormons’ immigration attitudes set them apart,” we find out some of the areas where Mormons are seen as questioning, challenging or supportive in response to the current political cycle. The article begins by stating, “U.S. Mormons are more conservative (66 percent) compared to the general public (37 percent), and on most issues, they closely track white evangelicals. But immigration is one issue that sets Mormons apart from their evangelical counterparts.” There is some very good information presented and the Desert News presents this hot topic in a way that can help all readers get a clearer picture about what Mormons believe concerning immigration. The comparisons between white evangelicals and Mormons are dramatic, as we see in the article. 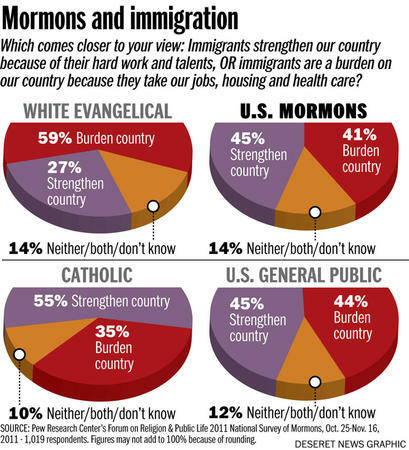 For example, “59 percent of white evangelicals said they (immigrants) are a burden, while only 41 percent of Mormons felt that way compared to 44 of the general public.” It is pointed out that this may be a bit of a surprise finding based on “how staunchly conservative Mormons are on nearly every measure.” There are most likely a number of reasons for these results, and according to Dan Cox, Research Director at the Public Religion Research Institute in Washington, D.C. there are some specific reasons, and the Deseret News does a great job pointing these out. First he mentions the demographics, stating “white evangelicals are significantly lower on the socioeconomic scale than most other religious groups. Those who are more economically vulnerable are more likely to see newcomers as a threat.” As the research shows, there is a strong connection between Mormon religious commitment (which was addressed the Deseret News third piece in this series titled LDS religious commitment high, Pew survey finds) and a higher socioeconomic status. Mormons are generally higher on the socioeconomic ladder than are white evangelical protestants. Education seems to impact this dramatically as “Eighty-four percent of Mormon college graduates are highly committed to the Church, but just 50 percent of those with high school education share that same level of commitment. This socioeconomic gap also translates to immigration: 50 percent of less committed Mormons see immigrants as a burden, against 36 percent of highly committed Mormons.” There is no doubt that education creates an opportunity to learn more and understand others better. With education such a high priority and encouraged within the Mormon religion, there comes a better understanding of topics such as immigration. The LDS religion is a worldwide religion. It spans across every continent, and the growth shows no signs of stopping. This globalization of the Mormon faith is another reason there seems to be more tolerance on the topic of immigration. As pointed out in the Deseret News piece, “the Mormon tendency to be more tolerant of immigrants,” can be due to the outward focus of the LDS church and the percolating influence of missionaries returning from foreign lands. “When you have more interaction with someone,” Cox notes, “you have increased comfort with them.” One statistic conveys the impact of this element of Mormon culture: 70 percent of the 33,000 students at BYU are bilingual.” As one who is both a BYU graduate as well as fortunate enough to be bilingual, there is something empowering knowing that you have the ability to be a connector for others. Learning a language means you have learned about another culture and when this happens, there is a commitment that burns within you to see equality and opportunity for those for whom you have come to know, respect and love. An important aspect of this very important and current topic of immigration was addressed in this Deseret News article when the article shared some thoughts from Utah House Rep. Chris Herrod of Provo. He pointed out “that the Pew study addresses immigration per se, rather than illegal immigration, and says he has often been puzzled when debates on the two issues become muddled. “I believe in immigration,” he says. “It’s the melting pot that has made the country great. But lately we seem to be splitting into a bilingual and bicultural nation.” He goes on to talk about the importance of giving equal chances to all countries and people. 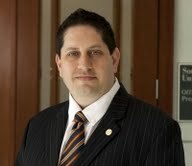 The article brings up the influence the LDS Church as an institution can have on this topic. As church leaders express views, people are listening. It seems that some want the church to take a hard stance while others want the church to be removed completely. The reality is, the LDS Church has been and will continue to be in a rapid growth mode around the world. Because the Mormons around the globe are taught the same principles, believe in the same Jesus Christ, Holy Bible, The Book of Mormon and all the other teachings that are taught, there is a common bond created. As full-time missionaries return home from their service, they bring with them a new found love and commitment to a language, people, culture and common religious beliefs. As such, there will continue to be important dialogue that needs to take place. The LDS Church and the Mormons that follow the teachings will need to be a continued part of the discussion because of their global outreach. As stated in the article by Charles Morgan, a BYU sociologist who studies immigration, “culture and Church positioning are mutually reinforcing.” Lately, local and federal attitudes have been influenced by the LDS Church toward being more compassionate when dealing with immigration issues. Those commenting on the Pew Study’s findings on Mormon views of immigration talk about the percolating effect of returning Mormon missionaries. I am one of those. Mormon missionaries put their life on hold to go and serve those where they are called to serve. They are nervous, excited, anxious and filled with the anticipation of having amazing experiences. When missionaries receive their call to serve, they are notified of a location as well as a language. If they are to learn a second language, they will be in a Missionary Training Center for around 8 weeks, while those that will be speaking their native language will there for around three weeks. Now, there are rare occasions when something can change in the missionary training center or even out in the mission field. We are in what is known as a political year. There are going to be many topics debated, discussed and questioned. One of those that is at the top of the list is that of immigration. Now, how does my mission and this topic come together? Like this. See I was called to serve a full-time mission in the New York New York North Mission and in the English-speaking program. I loved my call and could not wait to serve the amazing people in New York City and surrounding areas. After my three weeks in the missionary training center, I arrived in New York City. I spent the first six months working with the English-speaking missionaries and members. I had so many wonderful experiences but I felt myself being drawn to the Hispanic people. It is hard to explain, but there just seemed to be a connection. Then one night I received a call from my mission president who informed me that the next morning, I would be starting in the Spanish program. A little surprised, yes; nervous, you bet; excited, very; confused a little. See I did not speak Spanish. I was then informed that I would need to learn the language at the same time I would need to do all the regular work that missionaries do. Since I did not have the missionary training center language-training experience, the Hispanic people were my teachers, thus I gained the type of love for these people that you have for your family. I was humbled by their willingness to serve, their desire for a better life and the example of hard work they showed me every day. As I returned home and back to my normal life, I still wondered why I was switched into the Spanish-speaking program. Wherever we have lived, I have the opportunity to use my Spanish, but it was very limited until we had the amazing opportunity to move to Mexico City with the company I worked for. We feel in love with Mexico. We are in love with the people, culture and history. Sure, we had our struggles, especially since my wife and boys did not speak Spanish when we arrived (but they had a desire to learn). That desire to learn gained enormous respect from the locals, and they would always help us learn the language. We saw many great things, but we saw many things that hold that country back from really reaching its full potential. We became good friends with so many there in Mexico, and we miss it dearly. As now the topic of immigration is gaining more and more press, I am trying to understand and define my feelings, as they are many. We have some who are saying build a fence, others saying to send all the illegals back to their countries, and some who are trying to balance it out by improving the system while also protecting Americans. I will never forget when one of the locals in Mexico who helped us around the house told us about her sister. While in our home, she received a call that her sister had made the decision to go with some other family members to America. She was going to leave her six kids behind and asked her to take care of them. It must have been about three weeks later, that she again received a call from her sister and they had made it across the border. There were tears on both ends of the phone. Part of those tears were for the safe arrival and some were for the fact that they were now going to have a new life. See, they had found work and would be able to send money back to the family to help pay for food, shelter, and clothing, the necessities of life. Our family was amazed and impacted by this experience. Here were incredibly good, hard working people who risked their life for freedom and opportunity, things we took for granted. Did they break the laws of both countries? Yes. Did they harm others to get there? No. (However, putting a drain on America’s social services as illegals could harm Americans.) Would they now be able to provide a better life? Yes. Were they willing to do the work that Americans were not willing to do? It sure seemed like it. All that said, no, I don’t support illegal immigration, but I think we must find a way to help those who want to come to this country for opportunity. A work-visa system? I have done research to find out how everyday people can help illegal immigrants become legal, and the process is not realistic. Our family gets upset when we see Mexico depicted as a bad country. We have lived there, and we have grown to love the people and culture. It is painful to know that we are getting closer to a situation where many of these great people will be sent back to their country, and most likely become a burden to their own society, as their governments are not prepared to handle them. Many are skilled workers with passion, drive and desire. (Sometimes, I wish more Americans had these traits.) At the end of the day, we must follow the laws of the land, but we cannot disregard the moral compass that was instilled in our hearts by our Creator, because to Him, none of us is illegal. To see the entire 5-part Deseret News report, go to Mormons in America.